Home of the Detroit Tigers, Comerica Park is a great place to catch a baseball game in the spring and summer months in Detroit. Just grab a ball park coney dog, wear your orange and blue in pride, and cheer along. Detroit Tigers’ pitcher Justin Verlander at Comerica Park, taking a break from practice to cheer on Team USA during the World Cup. Detroit Lions’ Running Back Reggie Bush at Comerica Park with wife, Lilit Avagyan Bush. Model Kate Upton at Comerica Park with a friend. Once the Tigers have finished playing (and winning, hopefully), don’t rush out of the stadium too fast. On the way out of the front entrance, you will pass the famous Comerica Park tiger statue. A popular photo opp for selfies and group shots. Like any city, Detroit has a lot of beautiful, creative graffiti. One of our favorite pieces is the superhero graffiti near St. Andrews Hall, just off E. Congress St. between Beaubien and Brush. Let’s be honest, some of this artwork is just too badass to not take selfies with. If you are looking for a truly gorgeous view of Detroit, snap a photo from the Detroit riverfront, Belle Isle, or anywhere else where you can get a clear view of the Detroit Skyline in all its glory. Detroit photographer Joe Gall (better known as Camera Jesus) is notorious for his daring Detroit selfies. One of Detroit’s most iconic monuments, The Spirit of Detroit is located at the Coleman A. Young Municipal Center on Woodward Avenue in Downtown Detroit. Depending on the time of year (and whether or not one of Detroit’s sports teams make the playoffs), you may see him dressed up in some Detroit’s sports jerseys, rooting on one of our home teams! Fall Sundays in Michigan were just made for Detroit Lions Football. So if you are heading into Ford Field to watch the Lions play some ball, don’t forget to snap a selfie before the end of the game. If you’re lucky, maybe one of the players will snap a selfie with you! 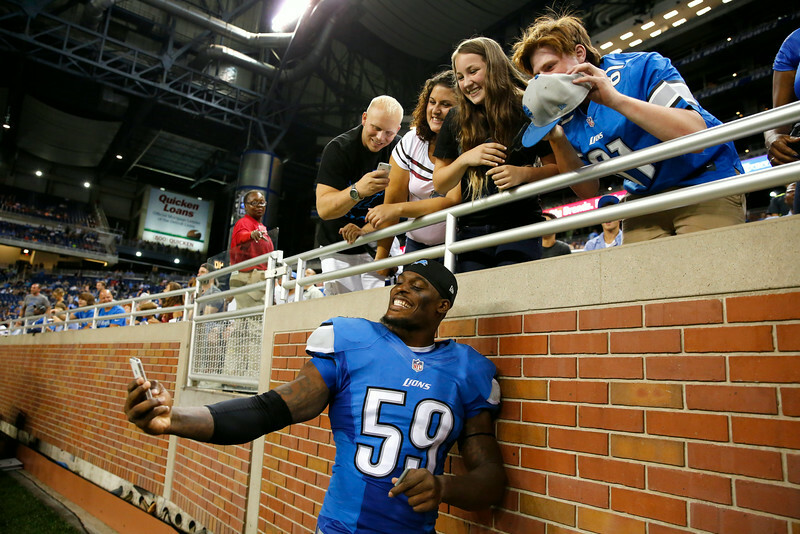 Detroit Lions’ linebacker Tahir Whitehead shoots a selfie with fans after a Lions victory. While Detroit is working hard on cleaning up its streets and making the city a cleaner place, there are still a lot of beautiful ruins throughout Detroit. (#ruinporn) If you get adventurous throughout your travels, snap a shot before these ruins are gone for good and new, beautiful buildings pop up in their place. Tony Hawk and his wife in one of Detroit’s old churches. Maejor Ali on his music video shoot in Detroit, directed and produced by Hello Aerial, a Hello Innovation company. Tony Hawk in Detroit, in front of the Brewster Project Demolition. To complete the Detroit Sports Team trifecta (the Detroit Pistons actually play outside of the city, in Auburn Hills), you gotta take a picture in Joe Louis Arena – where the Red Wings play. And you better go get your photo soon! The hockey team has plans to build a new hockey arena in the very near future, so the days of Joe Louis Arena photo opps are limited. Detroit artist Mike Posner stopped by the Red Wings locker room to pose in front of Datsyuk's locker. One of Detroit’s largest beacons of culture in the city, The Detroit Institute of Arts has one of the largest, most significant collections of art in the country. Not only that, but the steps outside of the DIA also played home to Detroit’s largest selfie during Detroit Week this past February. The last, but perhaps one of the most iconic, Detroit selfie spots you must stop at while you are in the Motor City is the Monument to Joe Louis – also known as “The Fist.” This famous monument is a memorial to the famous boxer and is located in Detroit’s Hart Plaza. This sculpture was created to represent the power of his punch both inside and outside the boxing ring, and it has also become a notorious symbol for the strength and resilience of Detroit. Have you ever taken a photo at one of these famous Detroit selfie spots? Or did we miss any of your favorite photo opps in the city? Be sure to let us know in the comments below. Also don’t forget to tag us in your Detroit Instagram selfies – Instagram.com/HelloInnovation!